Mirroring360 provides you the ability to mirror the display screen of devices such as iPad, iPhone, Android Phone or tablet, Chromebook, PC, or Mac to computers wire-free! Mirroring an iPad / iPhone or Mac screen is achieved using the AirPlay™ technology made by Apple, all you need to do is simply install the Mirroring360 application to the computer you wish to mirror to and start mirroring! Mirroring Android screens require the installation of Mirroring360 Sender on to your compatible Android device. Mirroring a Windows PC screen requires the installation of Mirroring360 Sender on your PC. NOTE: If you don’t see the AirPlay button in the Control Center, try Mirroring Assist from the App Store and follow the step-by-step instructions within the app to connect. Click the “Start Sharing” button. Give the viewit.at URL to your participants verbally, by email, or by copying and pasting the link into a messaging or chat conversation. Participants can click the link to start viewing your computer screen in a web browser on their computer or mobile device. 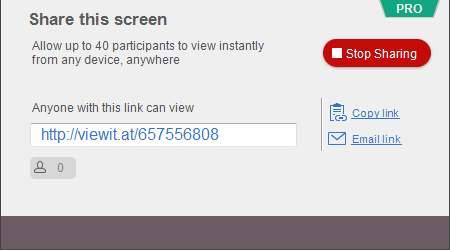 * The person icon indicates the number of participants currently viewing your screen. *** Internet access is mandatory for screen sharing.